Ask Philadelphians what is the fanciest address in the city and they are likely to say Rittenhouse Square. Located at the intersection of Walnut Street and 19th Street, Rittenhouse Square houses many posh hotels and restaurants. Few locals know, however, that the prime location is named after astronomer and mathematician David Rittenhouse. David Rittenhouse was born in 1732 in an early industrial community, set on a stream, that was then outside the boundaries of Philadelphia. Later incorporated into the city, the enclave is now called Historic RittenhouseTown. 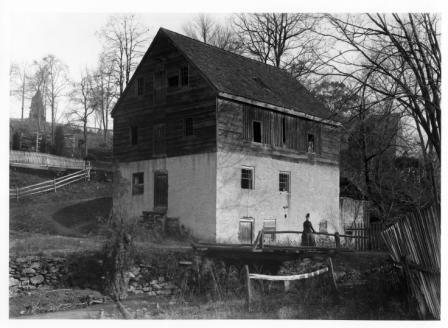 Circa 1702 Mill, photographed in 1890, courtesy of Historic RittenhouseTown. The story of RittenhouseTown dates back to the 17th century, when German-born papermaker William Rittenhouse emigrated from Holland to Philadelphia and established the first paper mill in the Colonies. Because of its success, a second mill and bakehouse were constructed, along with the Rittenhouse Homestead. Generations of papermakers, weavers, and other industrial workers lived in the community supplying important products for the colonies. Historic RittenhouseTown is open for tours. Surrounded by parkland, it is located at 206 Lincoln Drive in the northwest part of Philadelphia. It is open summer weekends from 12:00 pm to 4:00 pm. 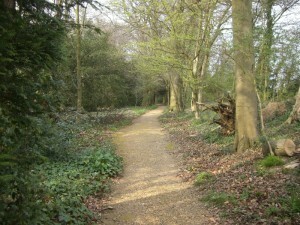 It is also open on weekdays, if arranged in advance, for groups of 10 or more. 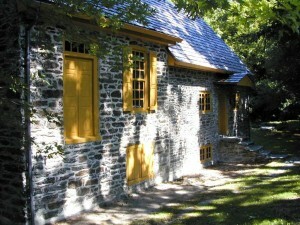 Rittenhouse Homestead, photographed in 2006, courtesy of Historic RittenhouseTown. The great-grandson of William, young David demonstrated great mathematical and scientific prowess, studying Newton’s Principia on his own. He became adept at building mechanical devices and established his own clock-making and instrument-making business. Combining his scientific interests, particularly in astronomy, with his mechanical skills and craftsmanship, Rittenhouse set out in 1767 to build an orrery: a machine replicating the motions of the planets and moons in the Solar System using Kepler’s laws as a guide. He also constructed a modified refracting telescope to record the transit of Venus. After repeating Hopkinson’s experiment, Rittenhouse decided to resolve the issue by developing what became the first diffraction grating. By placing fine hairs parallel to each other, he constructed a grating with about 250 lines per inch. He then turned to the subject of precision timekeeping and astronomical measurement, constructing the first collimating telescope. 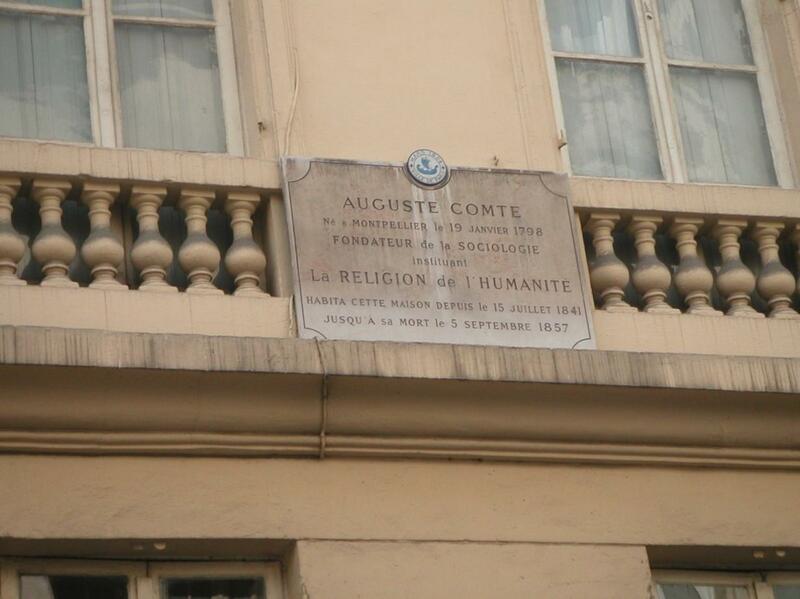 Rittenhouse was honoured much in his life. In the 1780s he was appointed the University of Pennsylvania’s first Professor of Astronomy and Vice-Provost. In 1791, one year after the death of Franklin, Rittenhouse was elected to be the second president of the American Philosophical Society. Rittenhouse held that position five years, until his own death. In 1825, Philadelphia renamed what was previously called Southwest Square after him, and Rittenhouse Square soon became known as one of the fanciest locations in the city. The physics and mathematics building at the University of Pennsylvania is named David Rittenhouse Laboratory in his honour. I thank Chris Owens, Director of Historic RittenhouseTown, for his help and for supplying the photos for this article. Parts of this article are adopted from “Philadelphia: Life, Liberty, and the Pursuit of Physics,” by Paul Halpern, published in Physics in Perspective. Paul Halpern, “Philadelphia: Life, Liberty, and the Pursuit of Physics,” Physics in Perspective 11, No. 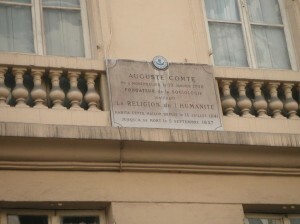 2, (2009), pp. 209-227. It was probably not too difficult to come across something having to do with Charles Darwin when visiting Cambridge, England before 2009. Following that year’s celebrations (of Darwin’s birth in 1809 and publication of On the Origin of Species in 1859), I can imagine it is guaranteed Darwin will cross your path. 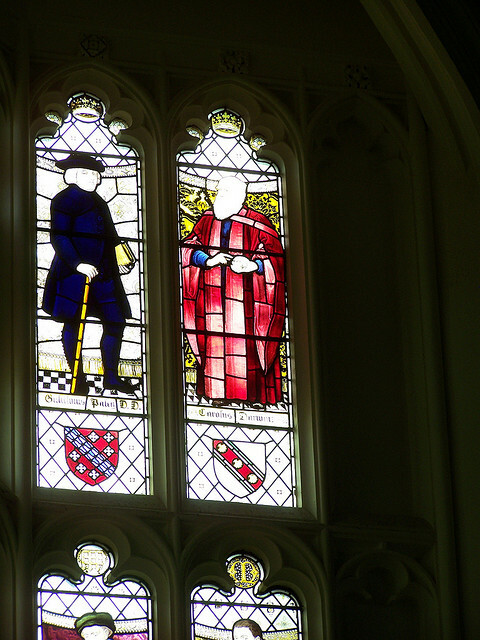 I visited Cambridge in the summer of 2009 to attend a conference about, well, Darwin. I spent two days beyond the conference exploring the town and visiting sites related to Darwin with Richard Carter, whom we can thank for Darwin’s portrait gracing the ten pound note. Cambridge is also where he met two of his mentors, botanist John Stevens Henslow (who recommended Darwin for naturalist on HMS Beagle) and geologist Adam Sedgwick, who would both take issue with his transmutation theory years later. His older brother Erasmus was also at Cambridge, and Darwin sent three of his sons there as well. 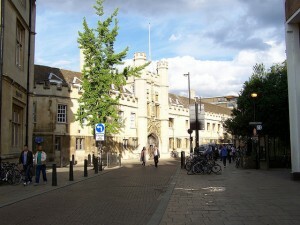 Some of the museums in Cambridge now hold specimens Darwin collected around the world. The Cambridge University Library holds many of his documents, including letters, and Cambridge University Press has published much about Darwin, including the correspondence series. While the Tutor of the College thought Darwin was practicing with a horse-whip in his rooms, he was in fact blowing out a candle with the puff of air from a still-capped shotgun. That shooting practice surely went toward Darwin’s collecting practices in the field. 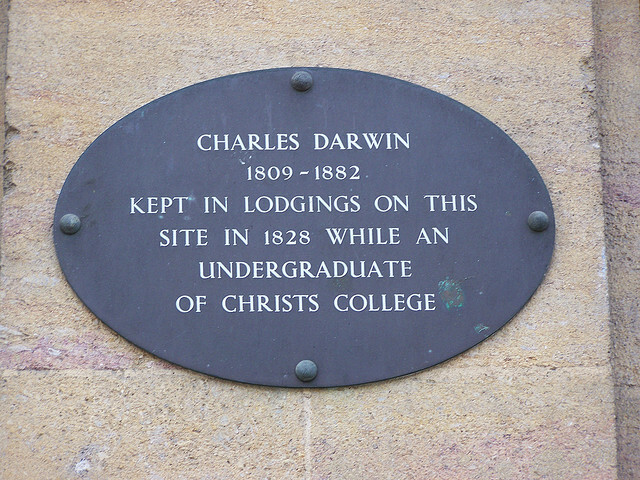 There is an old Cambridge rumor that Darwin’s Christ’s College rooms were once those of theologian William Paley, whose Natural Theology Darwin read while at Cambridge. In the College Hall, a stained-glass portrait of Darwin rests next to that of Paley. In December 1831, Darwin left England aboard HMS Beagle, and returned in October 1836. 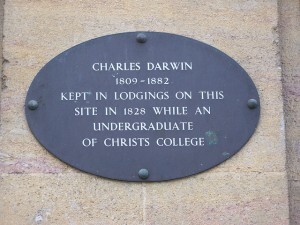 Darwin went back to Cambridge in December following a visit home to Shrewsbury. He took lodgings at 22 Fitzwilliam Street, and here Darwin organized his specimen collection from the voyage. Only a few months passed before Darwin decided he needed to move to London, to enter into the scientific community and farm out his specimens to zoologists, botanists, and geologists of repute. Janet Browne described this lodging as Darwin’s “temporary centre for a storm of industry” (p. 346). Today, the Fitzwilliam lodging is marked by a stone plaque. While Cambridge took little of Darwin’s more than seventy years of life, this place had profound influence on the creation of a young naturalist. 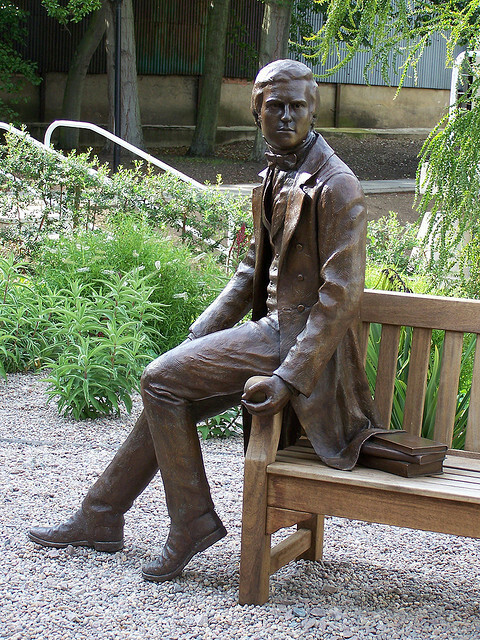 Today, the city marks with plaques, sculpture, and exhibits one of its most famous students, who deemed his three years at Cambridge, as he wrote in his Autobiography, “the most joyful in my happy life; for I was then in excellent health, and almost always in high spirits” (p. 68). All photos by Michael D. Barton, July 2009. » View more Cambridge photos by Michael Barton. Barlow, Nora, ed., The autobiography of Charles Darwin 1809-1882. With the original omissions restored. Edited and with appendix and notes by his grand-daughter Nora Barlow, London: Collins. Browne, Janet, Charles Darwin: Voyaging: A Biography, New York: Alfred A. Knopf, 1995. Specifically, chapters 4-6 and 15. 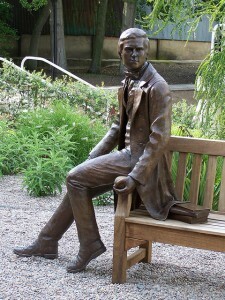 John van Wyhe, Darwin in Cambridge, Cambridge: Christ’s College, 2009. West Front, Poltimore House, by Derek Harper. Image licensed under Creative Commons Attribution-ShareAlike 2.0 license. 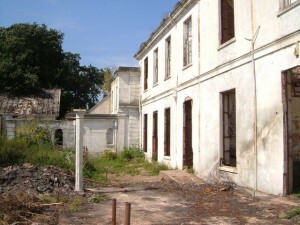 Part of the west front of the house, with the badly-damaged early C20 ballroom on the right. Poltimore House, near Exeter, is one of the most fascinating historic estates in the South West of England and is of particular interest for visitors keen to learn more about medical history. The site on which Poltimore House stands has been populated since the 1000s. The original Tudor mansion – elements of which are still visible in Poltimore House today – was first erected in the 1550s and belonged to the Bampfylde family for five centuries. 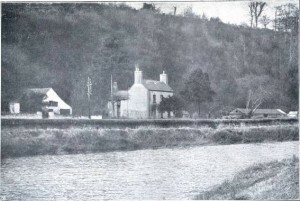 In 1921, after the house had been extended and modernised repeatedly, the private residence was turned into a girl’s school, Poltimore College. During the Second World War, it housed the boys of Dover College, Kent, who had been evacuated to Devon. Even though Jocelyne Hemmings describes this period in one of the chapters of her book A Devon House: The Story of Poltimore House (2005), a lot is still unknown about Poltimore House’s history as a hospital. Visitors with an interest in the history of medicine will therefore be keen to know that the Poltimore House Trust is hoping to start a research initiative to understand better this aspect of the estate’s past. According to the Secretary of the Poltimore House Trust, Dr Claire Donovan, the project will include a substantial oral history element. The Saloon, Poltimore House, by Derek Harper. Image licensed under Creative Commons Attribution-ShareAlike 2.0 license. 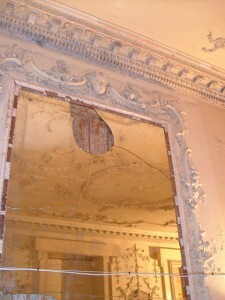 Early C18 Rococo plasterwork, with the ceiling reflected in a smashed mirror. The cherub might be modelled on Queen Anne's son, the Duke of Gloucester - but might not. Researching Poltimore House’s medical history is part of a much larger series of projects, events and initiatives run by the Trust. 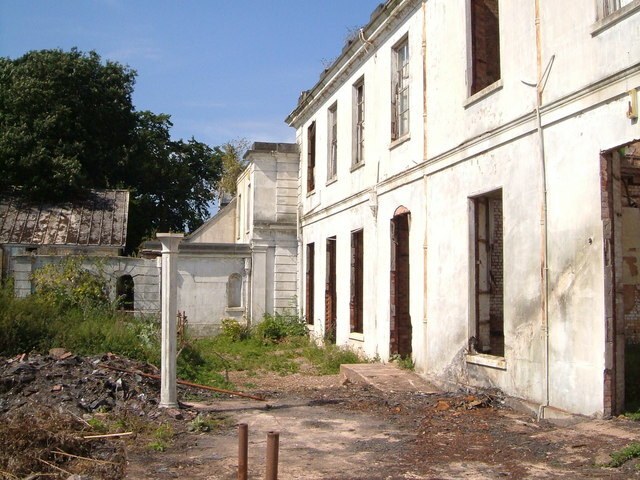 The primary goal is to raise sufficient funds to restore Poltimore House, as the building had been neglected since the NHS sold it in the 1970s. By the time the Trust acquired the estate in 2000, the mansion had become derelict and was in dire need of repair. With the support of the East Devon District Council, English Heritage and a number of dedicated volunteers, the Trust has started to restore Poltimore House and hopes to establish it as a new landmark in Devon. Poltimore House is located in Poltimore, Exeter, Devon, EX4 0AU. It is open to visits by the public. For more information on the history of Poltimore House and the different activities offered by the Poltimore House Trust, please visit their website at http://www.poltimore.org/. To find out more about any aspect of the Trust’s work, please get in touch with [email protected]. Hemmings, Jocelyne. A Devon House: The Story of Poltimore House. Bristol: University of Plymouth Press, 2005. 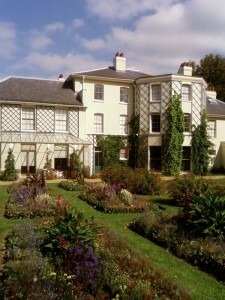 The Home of Charles Darwin, Down House, by Anthonyeatworld. Image licensed under Creative Commons Attribution-ShareAlike 3.0 Unported license. 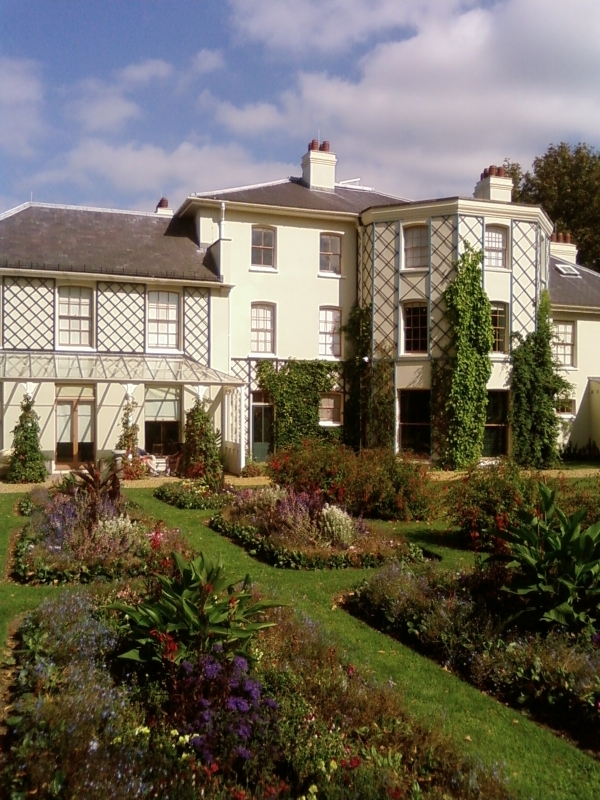 Darwin recorded in his autobiography that when they first found the house he ‘was pleased with the diversified appearance of the vegetation proper to a chalk district … and still more pleased with the extreme quietness and rusticity of the place’. At Down he hid away from visitors, even locating a mirror outside his study to warn him when someone was approaching. Yet in this quiet place Darwin received communications and visitations from naturalists and men of science worldwide, weaving together his grand picture of nature that was expounded in The Origin of Species (1859) and later writings. Down House was also the site of his own experiments and observations; no problem was too trivial or too minute to be worthy of his patient elaboration. Dotted around the grounds of the house are the sites of these experiments, concerning worm burrowing and, in the hothouse, carnivorous plants and orchids. The sandwalk, Darwin's thinking path, by Tedgrant. Image in Public Domain via Wikimedia Commons. Elsewhere in the gardens one can retrace Darwin’s steps along the peaceful Sand-walk, where he paced daily to mull over his information and formulate his arguments. 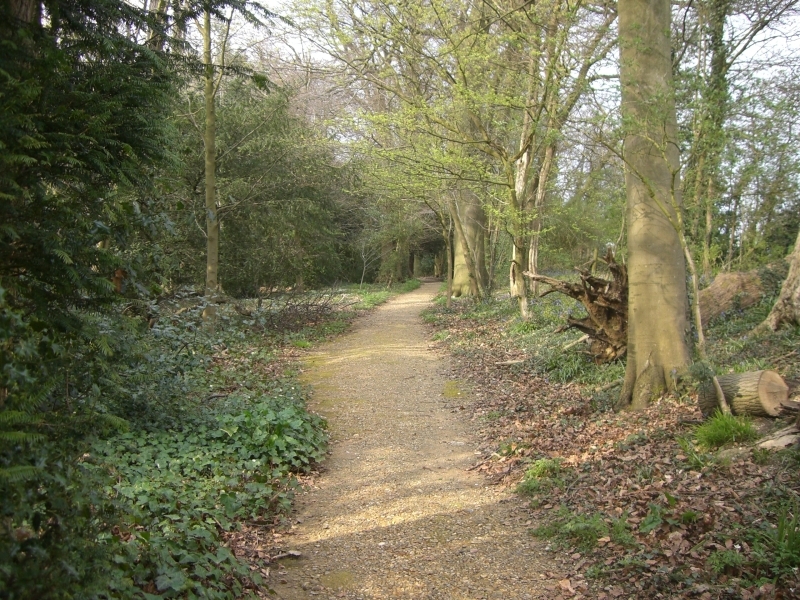 Charles and Emma planted this avenue shortly after their arrival, choosing a variety of native trees and flowers. Its constant susceptibility to invasive species of weed proved an immediate and frustrating instance of natural selection in action. 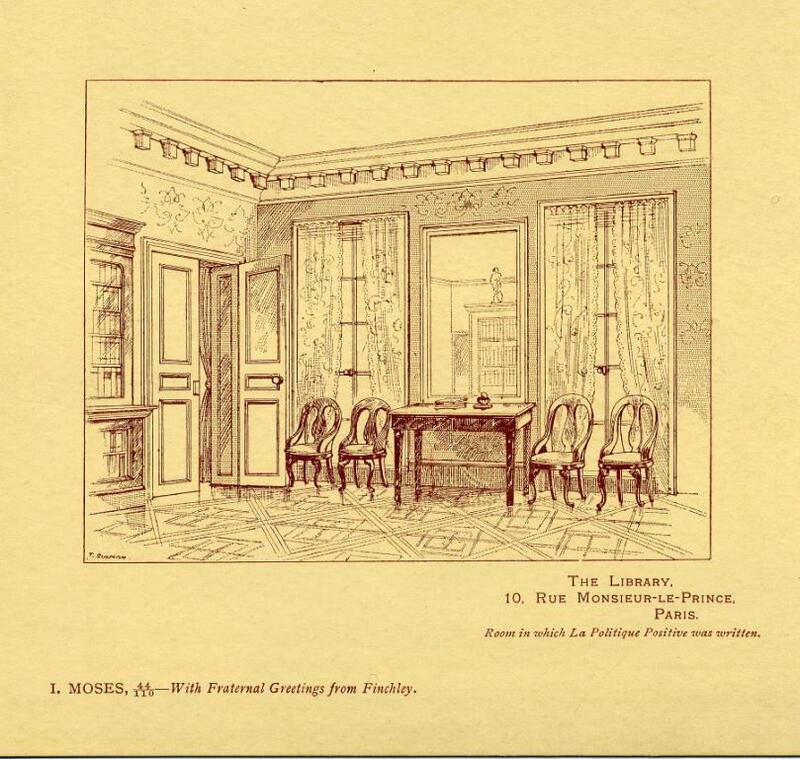 The house itself offers glimpses of the sentimental Darwin; permitting his children to toboggan down the stairs on a tea-tray must surely have interrupted his peaceful contemplations. This was not a house but a home. Each room has been reconstructed as far as possible based on photographs taken in the 1870s; Darwin’s study is recreated as it would have been, complete with bucket in the corner for those moments when his mysterious illness overtook him. 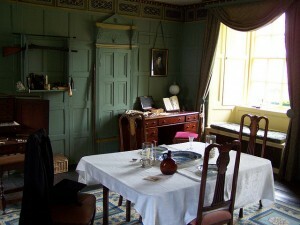 Charles Darwin's study at Down House, restored with original furniture including his wheeled armchair and writing board, by Mario modesto. Image licensed under Creative Commons Attribution-ShareAlike 3.0 Unported license. As a historian, I find myself slightly uncomfortable with the canonisation that inevitably accompanies the reconstruction of sites such as Down House. The English Heritage web site (9 March 2011) even refers to it as a ‘place of pilgrimage’. Such a construction of historic sites can result in unintentional bathos (here’s where the great man’s bottom sat), or more seriously in historic bias, creating the impression that only Darwin was the source of evolution by natural selection, and that his ideas came to him clear and perfect, the same in form as we know today. But even so … it’s undeniably something very special to come here, to see the home and gardens that produced some of the most enduring science, history and even myth of our times. Here you can catch a glimpse of the oft-forgotten cast of women, children, servants, visitors et al who are all a part of the ‘Darwin’ story. Highly recommended. Janet Browne, Charles Darwin: The Power of Place (Princeton University Press, 2003). Sigmund Freud's couch used during psychoanalytic sessions can be found at the Freud Museum, by Konstantin Binder. Image licensed under Creative Commons Attribution-ShareAlike 3.0 Unported license. Having remained in Vienna almost to the bitter end, Sigmund Freud and his daughter Anna eventually fled from Nazi persecution after the annexation of Austria in 1938 and set up their new home at 20 Maresfield Gardens, London. Though reluctant to leave, the Freuds had foreseen this eventuality and, over the years, shipped many of their possessions to Freud’s son Ernst Ludwig in England. Finally, Freud’s reputation as the founding father of psychoanalysis enabled him to bring all of his household effects and furniture with him when he fled. As the story goes, the Austrian storm troopers were afraid that history would never forgive them if they mistreated the eminent psychoanalyst. As a result, and though Sigmund himself died the following year, the former Freud estate in London now hosts a large collection of Freud’s worldly possessions. 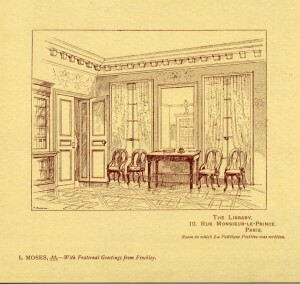 Indeed, upon his death, Anna apparently preserved the study and library in the way he had arranged them, so that one can now muse about Freud’s taste in literature, which includes – but is by no means limited to – Goethe and Shakespeare. Alongside Freud’s immense collection of Roman, Greek and Egyptian antiquities, there is also a portrait of Freud by Salvador Dalí. The highlight of any visit to this establishment, however, is the original couch upon which Freud’s patients reclined while he sat out of sight and listened to them. From Disney cartoons to Woody Allen films, this iconic setting has been reproduced countless times and has become inextricably linked with the very concept of psychoanalysis. 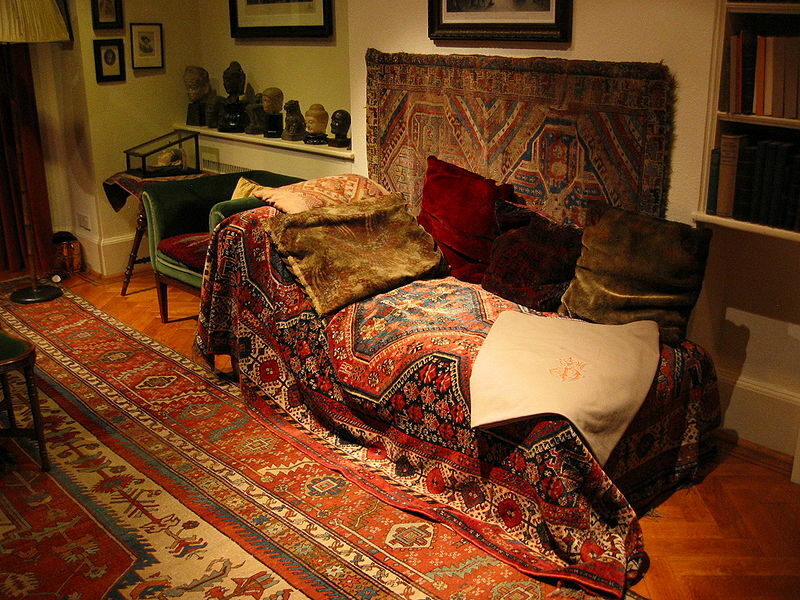 But visitors to the Freud Museum may be surprised to find that unlike the slick and sterile black leather couch that features in most popular accounts, Freud’s couch is actually covered by a colourful Persian rug. For more information and opening hours, see the Freud Museum’s website at www.freud.org.uk.